It’s probably not the done thing to be making pies when so many of you have New Years resolutions fresh on your mind, but the masses of veggies in this pie counteract the ridiculously thin layer of pastry on the top. Honest. 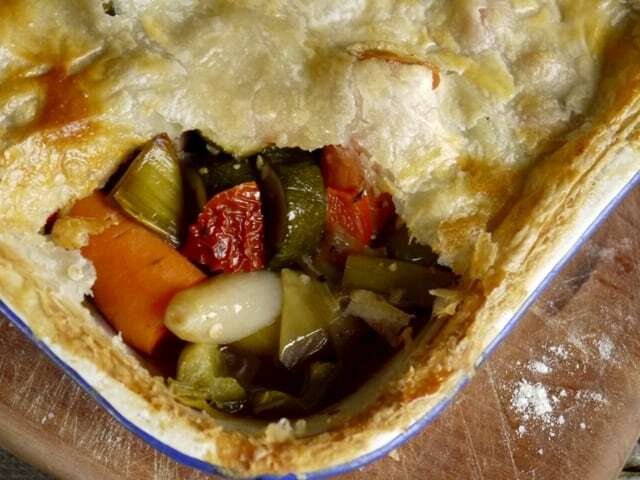 And why a ‘Sunny’ roast veg pie? Well, Cornwall has been making headlines yet again for the ferocious weather hitting our shores over the past couple of weeks, so I figured we all needed a little bit of sunshine, if only on our plates. Find the most colourful veggies you can if you make this pie for the family. Red, orange & yellow peppers are a great place to start, courgette, carrots, leeks, mushrooms, broccoli, sweet potato etc etc. Beetroot would taste great too, although it would turn everything purple making the pie more psychedelic than sunny. I sprinkled a chopped fresh chilli over the veggies before topping with the pastry lid, but feel free to omit if you don’t need that much sunshine in your life. Serve with a large glass of wine on the side to make up for all the virtuousness contained within the healthiest pie in the world. A baking pan full of colourful veggies chopped into good sized chunks. 1/2 jar of sun-dried tomatoes Save that oil for cooking with another day as it tastes so good, drained & chopped. Toss any root veg you are using in a little oil before roasting for 15 minutes. Add in the other veggies, coating them lightly in oil too, and roast for another 30 minutes, stirring them up every now & then. Season the veggies, and sprinkle with the fresh chilli pepper if using. 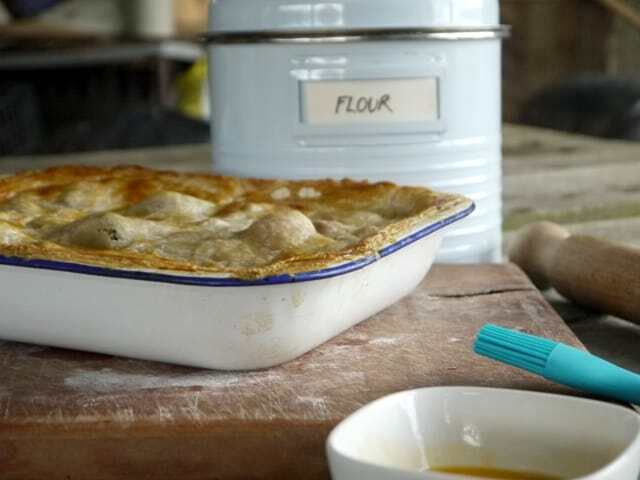 If you are cooking the pie straight away, then top the veggies with a pastry lid making it stick to the pan with a little egg wash round the sides. Egg wash the top of the pastry too before baking for around 20 minutes or until the the top is golden brown and smells delicious. If you are baking it later, let the veggies cool first before topping with pastry and leaving in the fridge until ready. Egg wash the lid just before baking, and add 5 or 10 minutes onto your cooking time if baking straight from the fridge (and bring the dish up to room temperature first if you are using a glass or ceramic baking dish). Shared with ‘In My Veg Box – Onions’ hosted by The Spicy Pear and Citrus Spice. Your pie does indeed look like a lovely ray of sunshine compared to all these miserable grey, wet and windy days. Fab idea! Love a roasted veggie and love a bit of pastry, delish. Making a pie myself tomorrow but I doubt it’ll be anywhere near as colourful as yours, nor as virtuous! Oh how delicious! And I love sun-dried tomatoes as well so I’d definitely add them in the pie :) Love that it’s full of veggies. I’ll try to send you some sunshine! We have plenty of sun but it’s bitterly cold. Brrrr! Please do Tammy, we’ve had horrednous storms over teh past couple of weeks. Lots of folk had serious damage to their properties and no power etc. We’ve been very lucky thank fully. Our son-in-law, Stewart, fetched furniture from you recently & our daughter recommended me looking at your website which I love! 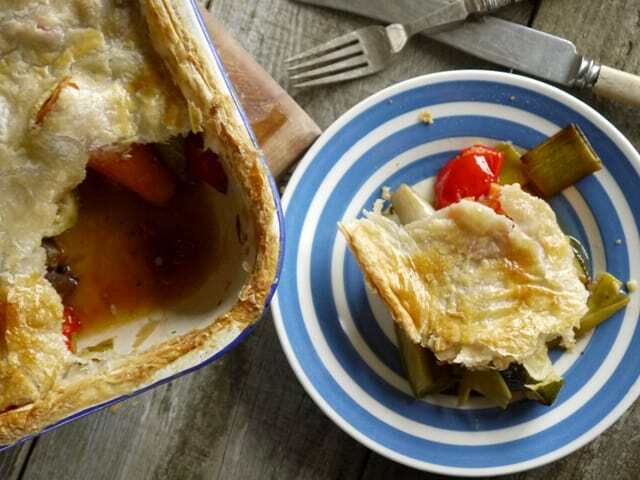 Aiming to make ‘Sunny Roast Veg Pie’ next week for vegetarian friends coming for supper so watch this space!! Diana! What a lovely message :) It was so fab meeting Pam & Stewart too, you know when you just click with some folk? It definitely happened with them! I do hope you (and your friend) enjoy the pie, it’s also good with some pesto stirred through the veggies before baking if it’s looking a little dry. Thank you so much for taking the time to visit & leave a message too, it’s always so nice hearing from people that read the site. Thank you for entering this recipe to this month’s In My Veg Box. This pie looks delicious and incredibly colourful.